In this winter holiday, don’t spend your holidays to visit those places you have to see every year. Plan something different. This year enjoy the ice and snow sculptures festivals and events. 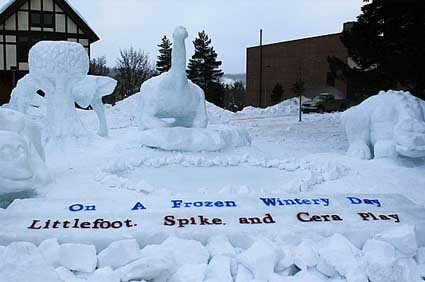 There are a number of international ice and snow sculpting events held in United States. Here we share some of the coolest ice and snow sculptures events and hope it’s enough for you to travel too far and too fast. 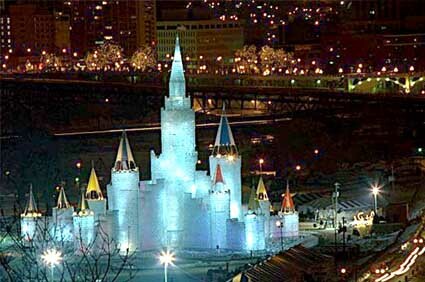 Enjoy the 129th Saint Paul Winter Carnival, the “Coolest Celebration on Earth” since 1886! Come and enjoy the fun full activities as part of the carnival celebration including, the Royal Coronation, Outdoor Beer Dabbler, Winter Carnival Medallion Hunt, Kid’s Day, Grande Day Parade, Ice Sculpture Carving, Snow Sculpting in Vulcans Snow Park, Klondike Kate Cabarets, Historic Art Exhibit and the Torchlight Parade. It continues to bring family-friendly events and community pride to Saint Paul and the Twin Cities metro area. Events are held throughout the city, with many centred in downtown Saint Paul in Rice Park and the Landmark Center. Michigan Technological University’s Winter Carnival was started in 1922 and now it has grown to become one of the largest annual winter festivals in the nation. 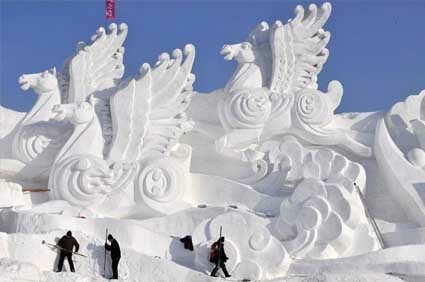 This carnival features dozens of huge, intricate snow statues all around the university campus. This event also brings together students to participate in broomball, comedy skits, sleigh rides, a queen coronation, and lots of winter fun. The International Show Sculpting Championships are one of the reasons people love it here in Breckenridge. From around the world snow artists will compete from Jan. 27 through Jan. 31, 2015 in Breckenridge, Colorado at the championships. Teams are using only hand tools, artists achieve finished pieces across five days (65 hours) of sculpting in this one of a kind event. All sculptures are displayed through Feb. 8, 2015, start as 12-foot-tall, 20+ ton blocks of snow. 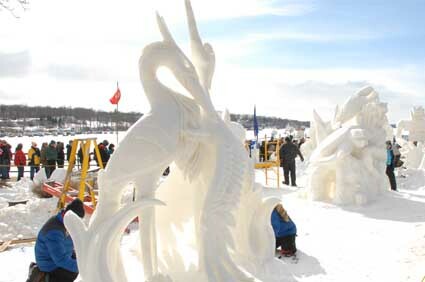 Enjoy the 20th Annual Winterfest & US National Snow Sculpting Championship Competition this year. It’s featuring music, magic, activities, refreshments, helicopter rides, shopping and dining. The US National Snow Sculpting Championship featured with the great event at the beautiful and famed Riviera on the lake front in downtown Lake Geneva. Sculpting begins 11am Wednesday, January 28th through Saturday, January 31st, with winners announced at 3pm at the Riviera Ballroom. This year few more events will include like; Laser Tag, S’mores, Beach Party, Fire Ring, Soup Taste, Family Magic Show, Human Dog Sled Races and a Reindeer Run. To read more articles like this follow us on twitter and become our fan on facebook. This entry was posted on Wednesday, December 17th, 2014 at 12:37 pm	and is filed under Uncategorized. You can follow any responses to this entry through the RSS 2.0 feed. You can leave a response, or trackback from your own site. « Top 6 Experiences You Can’t Miss On Winter Holidays!